I can’t believe that my once toddler is now a little boy and will be starting pre-kindergarten next week. I have so many mixed emotions. Very sad but also so ready for a few hours a day with my little baby toddler. Little by little he is growing up before my eyes and I’m trying to embrace every step. We are currently in the process of brainstorming for his new “big boy room”. 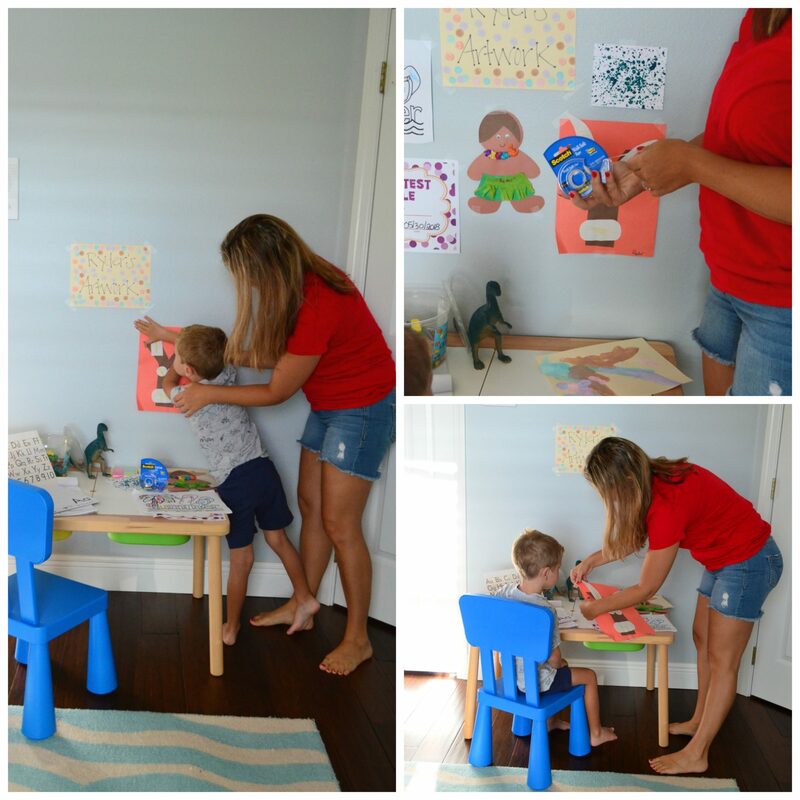 While brainstorming part of his room I wanted to create a DIY Creative Workspace for him. Where he can display his art work he creates at home and at school. 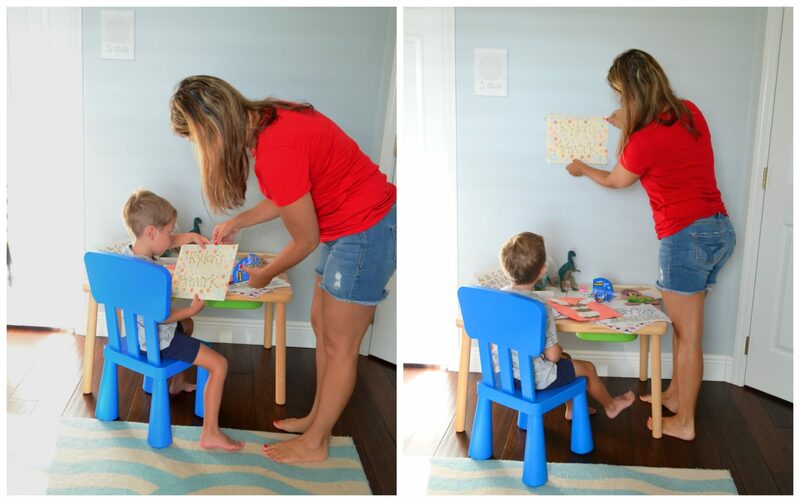 I also wanted a little table where he can draw, color, practice writing, and do any other creative thing in his room that he wishes in his new workspace. I’m all for hanging his artwork on his walls, and since he will be bringing home new artwork every week I know that we will be changing it out often. I love that the Scotch® Wall-Safe Tape sticks securely, removes cleanly, and doesn’t leave any residue or wall damage. 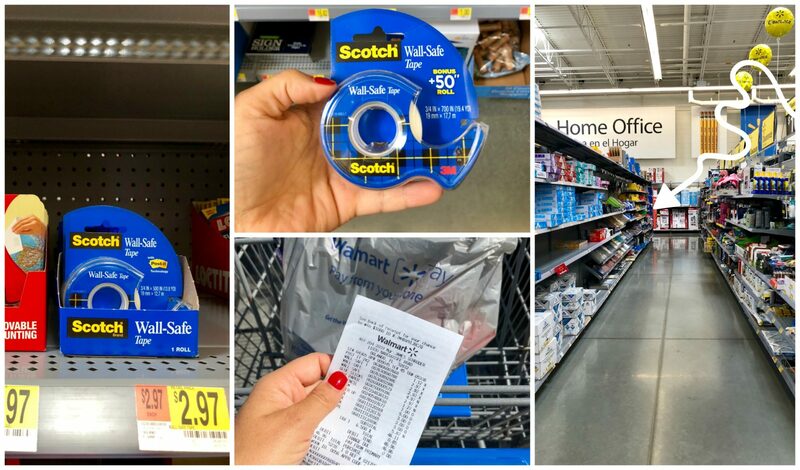 Best of all Scotch® Wall-Safe Tape can be found at Walmart. It’s my go-to place when shopping for back-to-school items. School is about to be back in session and Scotch wants you to roll with it. Let’s talk about what you need to make this super easy and cute creative workstation. First up–you can make a sign to hang on top of the artwork. I let my son help me decorate it and then I hung it up first to be the focal point of the wall. I then let my son select the artwork he wanted to hang. Next up, time to hang the artwork using Scotch® Wall-Safe Tape. I would pull and cut the piece of tape and then I would help him place the artwork on the wall. I can’t get over how much I love this tape. It’s reposition-able both on the wall and on the artwork. I love that it won’t rip his artwork! Once he changes out the artwork I can then save it in his artwork folder. Once we had all his artwork hung I then set up his table with crayons, ruled paper for practicing writing his name, coloring books, and anything else your child likes to use when creating art! This was a super simple 30 minute project. 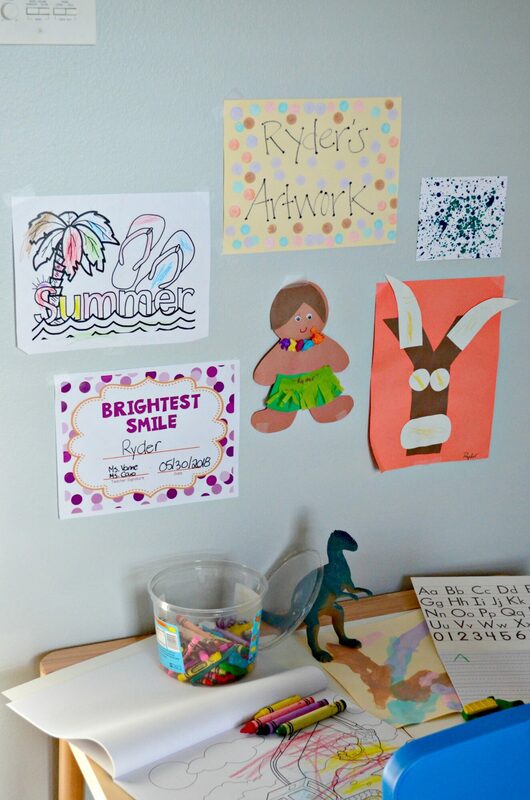 My son loves his new creative space in his room and is even more excited to go back to school, make artwork, and bring it home to hang on his wall. 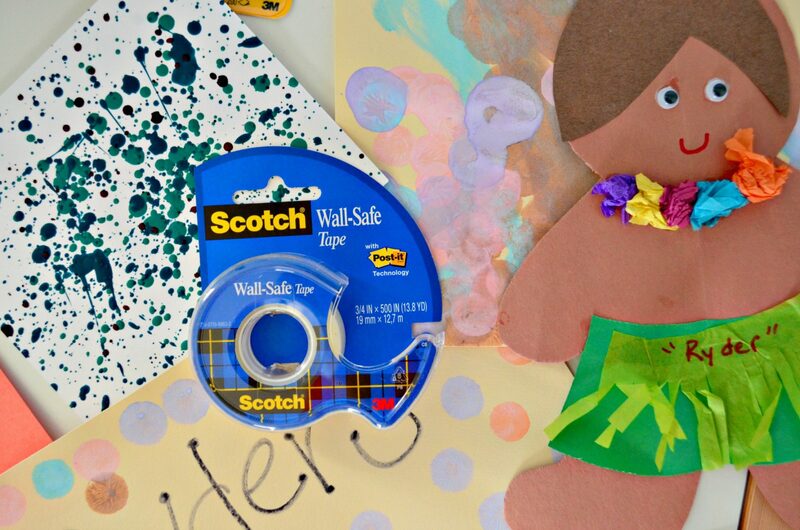 I of course don’t mind knowing that the Scotch® Wall-Safe Tape isn’t going to damage his wall or artwork! It’s a win-win. 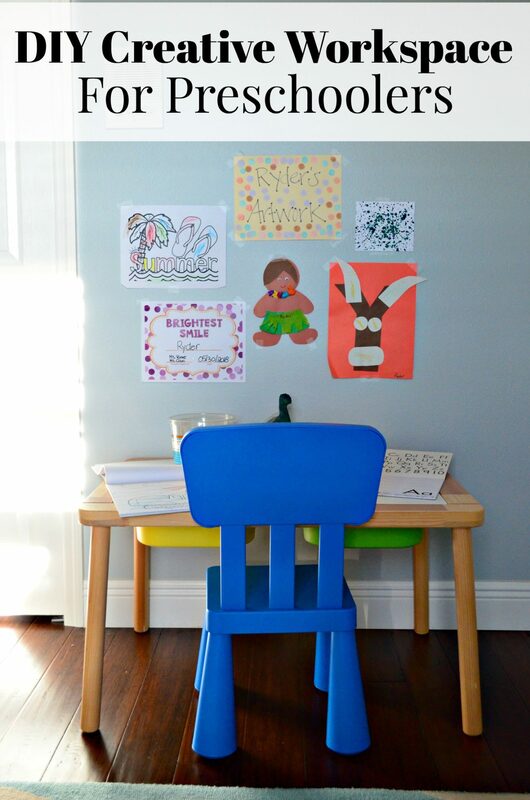 I hope this inspires you to make a similar creative workspace for your preschooler. For more back-to-school inspiration, make sure you visit the Create with 3M page. Remember, you can find all these great products and more at Walmart. The go-to place for back-to-school shopping. Get social with 3M on Facebook, Twitter, and Instagram.